long after the mood you said it in has left you. Love is not just an emotion. Love is when that giddy feeling and the cute things about the other person disappear, and you still decide to stay and love her anyway. Love is when you see her other side---the undesirable one, but you still stick around no matter what. Love is when you don't feel like kissing, hugging or saying "I love you", but you still do, because you have made a commitment. Love is more than just your libido or hormones on the all time high. Love is when you see past her dazzling eyes, her sweet smile, her adorable face and everything physical, and you still see beauty. It's not just a walk in the park. Love is hard work. Love is getting your hands dirty for the service of the person you love. Love is working on things together, a teamwork. It's not a one way street. Love is a mutual effort. Love is partnership. Love is work---a lot of work. Love is when you decide to hold on against all odds. So don't expect lazy people to stay. In any kind of relationship, love is a vital ingredient. And since love is hard work, only hardworking and committed people will find it. Love is more than the empty words spoken to make the other person feel special. Love is saying the truth, knowing that a little discomfort at the beginning will save you from future conflicts. Love is a decision. If you can't decide yet, don't mess up other people's lives. Love is not for the weak or the lazy or the complacent or the fickle-minded. Love is for those who have decided; no ifs, no buts, no maybes. Love is a conscious effort. Love is a deliberate action. 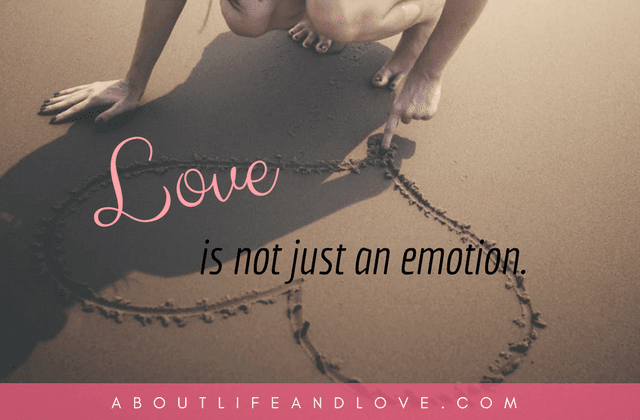 Love is not just an emotion. Love is a decision. I love this series of love quotes in as a whole even if I personally do not agree with some of them. I'm rather inspired by the story shared in the previous post by the unknown author. It is such an enlightening read! Thanks for coming by to visit. I reply here because there is no email connected to you. Have a very blessed day. 'Love is work - a lot of work'. How that resounded with me. I gave up on love so I could be me again. And I've never been happier! Aww. Love is timeless, and this is perfect! Yes indeed. I know hubby and I love one another to the moon and back. So true, your words are. Thanks. This one line changed it all for me- Love is a decision. That quote is beautiful! And your blog post is very well written! def there is much truth to love in your words today. Lovely photo and quote. Love is indeed a decision. I love this. I think we often underestimate what love is/takes, but that work and effort is what makes it so beautiful. Wow, and you have written all that? You are a wise girl! Of course that subject is timeless! I agree with all above, but it's a pity that many people wouldn't understand it! This is true- love really is so many things, So beautiful..
Love is a decision. I personally do not believe in soulmates, I see you, I'm attracted, I consciously decide to love you. Good, good stuff, Super Girl. All those emotions so quickly fly away like dust in the wind, don't they. Commitment's a rock solid word. Hard work. And rewarding for those who claim it strong. Pretty words to talk about love emotion, have a great week! Very pretty....maybe that why loving the next person is such a hard decision when you are jaded. Hi Lux! Love is certainly not for the weak or lazy. I see that every day in my husband who has to do so much for me now that I am recovering from my broken leg. (Valentine's Day post will be about that!) Love is a decision to be there when someone really needs you. Love can give without getting. Beautiful post! Thank you for sharing!! Lovely post! Sure gives some answers to "I want to know what love is". Love is a decision - I agree with this statement. Hi, dear SuperLux! Forgive me for being late. This post did not appear in my reader. I totally agree with this essay about the real meaning of love. To me, love is not as much a noun as it is an active verb. The highest form of love is unconditional love, the kind that looks beyond physical beauty and makes a deep connection with another person's soul and spirit. Divorce rates are high because people mistake sexual attraction for love and because the media encourages us to keep trading up until will find perfection. Real love is found in the trenches as two committed people face the struggles of everyday life together. I love this- and so appropriate for Valentine's Day coming up! All of these quotes seem very fitting with Valentines day around the corner. Keep spreading the love. I simply love this post. It was just so beautiful to read. And please don't forget to complete my Reader Survey. That black and white picture speaks volumes. What a stunning read. You are so good at writing such deep posts but you tackle them in a way that makes it so easy to read and understand. It doesn't overwhelm you. Yes, true love is forever. Which does not happen often and only remains in "was nice while it lasted." An excellent post. Love can make us weak at the knees yet can inspire us to be greater than we believe we are. So very true and beautifully written. True love is also sacrificial and is not for those who only want to receive and not willing to contribute. Thank you for sharing this beautiful post. I never thought of it that way, but now that I see your post, I have to agree that you're right. Love IS a decision. One month ago, I adopted a new cat from a shelter and decided I was going to love it no matter what. With people, I have never made this type of conscious decision, but it would be a good thing if I did. You nailed it, SuperLux! And when years and years of true love pile up, there is nothing better! Have a good one! "Love is work." Yes! How true that short little statement is. I have learned so much about love in my last 15 years of marriage. My husband teaches me every day what it means to truly love someone through it all. He is a keeper :). Such a beautiful, timely post! This is such a lovely post Jeann! This is so amazing Lux! Sorry I made a mistake with your name previously! Have a lovely day! So true, SuperLux... and it is coming in the right time. Love makes all things beautiful. yes it does and like you said..."Love is teamwork, it's not a one-man team"
Some lovely thoughts for Valentine's day! Lots of good advice here and I love the touching picture. Nice post as we approach Valentine's Day! I agree with all of this! "Love is a decision" - I really agree with this one. There may be days when you don't like your spouse but you can choose everyday to keep loving them. What a beautiful article! The quote in the beginning is perfect, too! This post is a keeper. It's a good reminder for all of us and every kind of relationship. I'm printing it out and putting it on my fridge. Thanks for sharing. Very nicely said, and touching!! I love to see old couples that show that they still love each other!! Also, it would mean world to me, if you visit my blog & follow via GFC if you like it. you are correct on all counts. love is hard work - but so worth it! staying loyal is something which lots of couple forgot as time past. You're excellent at expressing and "fleshing" out the whole meaning of a word or emotion - i enjoyed reading this a lot. Hope you experience much love through the month of February (and always of course). oh my goodness.. this is beautiful..
Love is everything you wrote, and more; though, sometimes we take each other for granted, and the lazy part kicks in. I'm so glad you decided to post this again! Hope you have a great Valentine's Day, SL! So, so true. Love is a decision and if you aren't willing to make it, stop wasting people's time. Loved that :) Thanks for linking with Grace and Truth. Only a few hours left for Valentines Day in my time zone, but I hope someone will read this. Someone who feels lonely and sad. You are so right about tttthe way we react ttto holidays. God loves us and that should fullfil all our needs. Happy VValentines Day from blogger care group and a very sensitive keyboard LOLLL! Love is a hardwork, indeed. Even our love for God entails that. It's a decision to obey Him in advance, whether consequences become favorable or unfavorable.